I think I might have mentioned a couple of times that I love Eggs Benedict. They are by far the best and most pleasing breakfast experience that I can imagine. The best ones I have ever had so far were the ones in Copenhagen. If you are ever in this corner of the world, don’t miss out on something great! 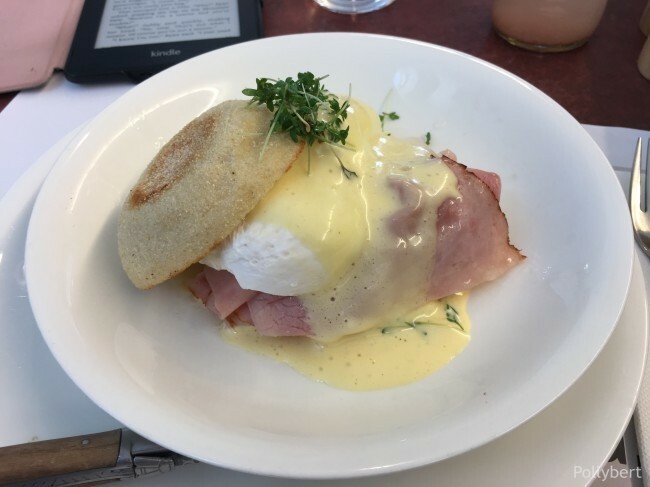 Drechsler: What you get served here as Eggs Benedict has nothing to do with said egg. First of all underneath is toast and not brioche or muffin. Which could be okay, but it just isn’t. Then is the ham fried and low quality. An absolute no go. And the eggs are boiled and peeled, there is no poaching here. And worst of all the sauce tasted ready-made. Really the chives on top didn’t help these eggs. Avoid! 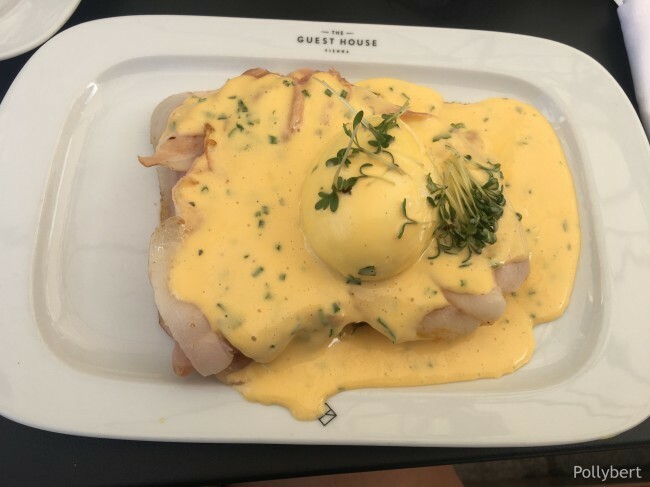 The Guest House: The regular Egg Benedict comes here with tomato pesto and an herbal sauce Hollandaise. And yes, it is only one egg which is not poached. The ham was bland, what a shame. There is really tasty ham on offer in Vienna. The toast didn’t add anything to the dish except soak up the enormous amount of sauce Hollandaise. It’s one thing to be generous and another to go completely overboard. But the biggest issue was the tomato pesto which gave the whole thing an acid tang. The thought behind it was probably to cut the rich sauce but it just ruined the overall taste. Avoid! Joseph Brot Bistro 1030: Here the eggs lie on an English muffin which was the best I have tasted in Vienna so far. The ham as well is pretty spectacular, Thum has outstanding quality which you can taste. Unfortunately the rest was a let down. Instead of the two eggs I got one and a quarter. The second ‘egg’ was basically just a small piece of egg white which must have floated around in the cooking pot. There was a bit too much cooking water in the plate. I hate it when the sauce Hollandaise becomes a yellow soup which floods the muffin and gives it a consistency of a wet rag. Quite disappointing since it started so well and looked so pleasing (the soup is behind the muffin). Still, worthy of your visit! Recommended! 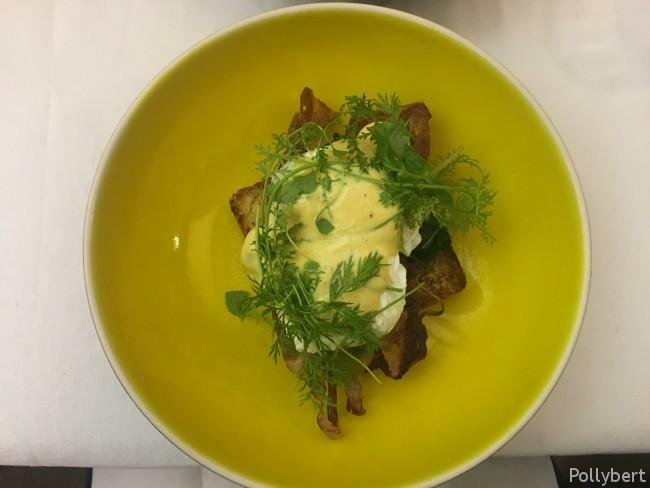 Ramasuri: Here you can a mix of Eggs Benedict and Eggs Florentine. Sadly no mix happened in the kitchen, we had to do switch the eggs ourselves at the table. Also the ham (bone-in ham according to the menu) was a different kind on the plate. The saffron hollandaise sauce was almost overpowering all other flavors and on salty side. The muffin had a buttery taste and the spinach just perfect. The overall impression was still good though. Definitely a place to visit again. Recommended! 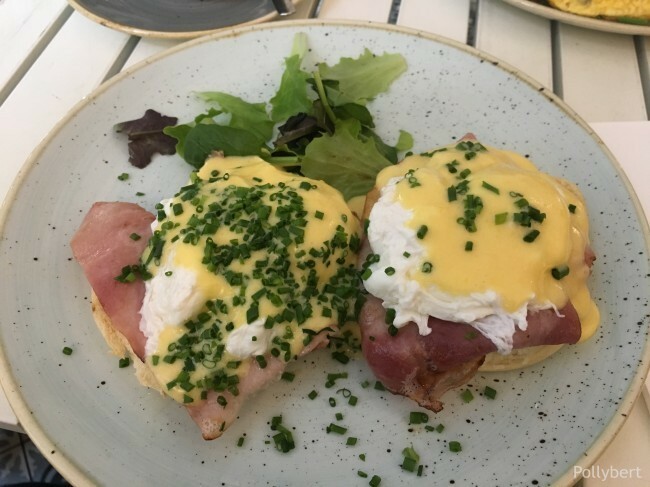 Café Telegraph: Here I went for Eggs Benedict (choosing a mix of eggs Benedict and Florentine is not an option here!). The order took awhile – so maybe don’t come here when you are starving. As quick as they were with the coffee, the kitchen definitely takes longer. 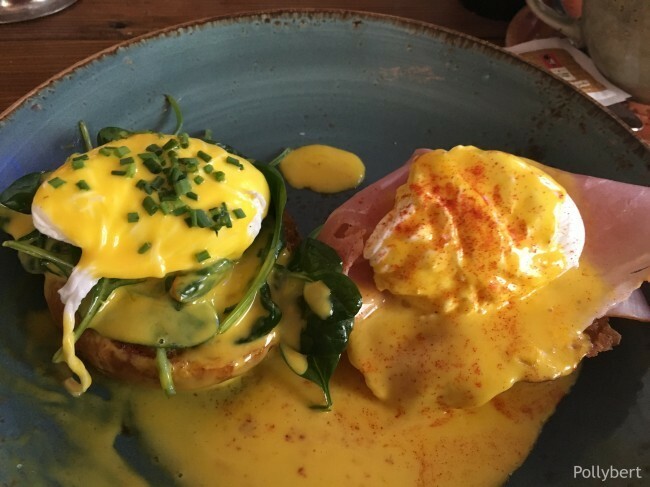 When it arrived, everything looked delicious and but sadly the Eggs Benedict weren’t great. The sauce Hollandaise was way too salty and sour. In combination with the egg yolk it could be eaten, but this dish was not a revelation. 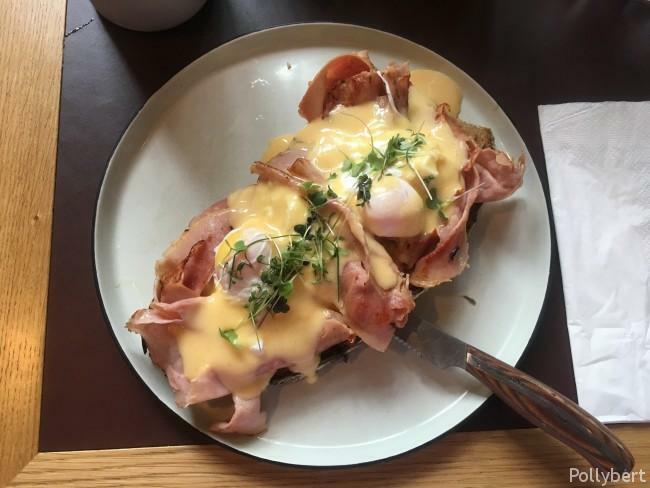 Figar 1040: One of the weirdest Eggs Benedict I have tasted so far. Instead of ham it’s bacon. Very crunchy though with an excellent flavor but just too much of it. Also there is only one egg, so no mixing of Benedict and Florentine. The egg comes on a slice of bread (even though it is Öfferl) with a bit of fresh spinach and tomatoes. The sauce Hollandaise is drizzled on top. It’s a very good bacon sandwich, but this is not Eggs Benedict. Salon Plafond: If you are lucky you can recognize the eggs as eggs. I only managed to see them the second time around. Unfortunately this is another place which doesn’t allow a mix of Eggs Benedict and Florentine. So I went for the Benedict to keep it more traditional. The eggs lie on top a mound of roasted ham which lies itself on a slice of bread. All of it is drenched in sauce Hollandaise which was actually quite good. Overall though a miss. 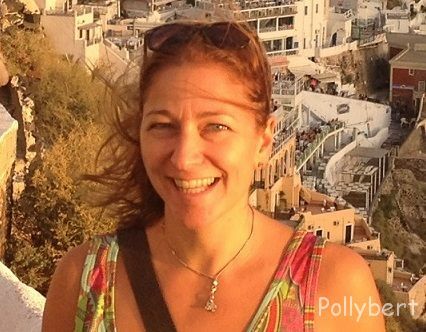 Hansen: I love this restaurant for breakfast, especially in winter. But even on a hot summer day it is gorgeous to sit inside the old stock market exchange, surrounded by lush plants from the neighboring garden and flower shop. The Eggs Benedict though don’t work. The restaurant serves two poached eggs on some kind of thick toasted white bread. 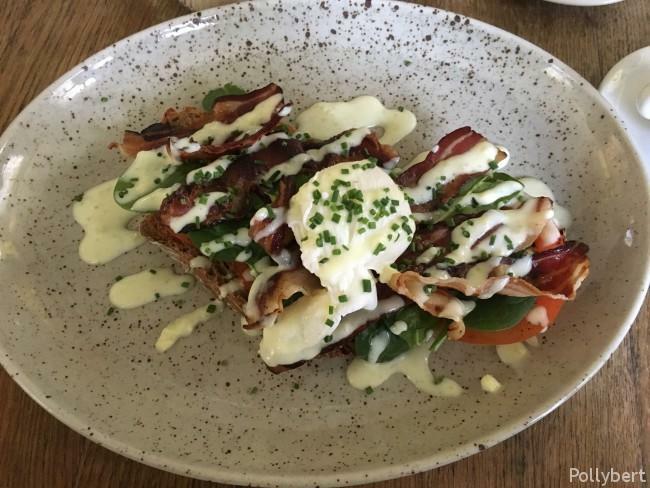 The famous rosemary bacon, wilted spinach and sauce Hollandaise round-up the dish. Except that the eggs are fully cooked and there is not enough sauce. Also the flavors don’t work. Maybe it’s the herbs on top? It was not a problem to get extra sauce, but there was a reason for the minimalistic approach before. The sauce is too sour and would probably only work in combination with liquid egg yolk. As nice as it looks, this dish is forgettable. 1. Bezirk, 2. Bezirk, 3. Bezirk, 4. Bezirk, 6. Bezirk, 9. 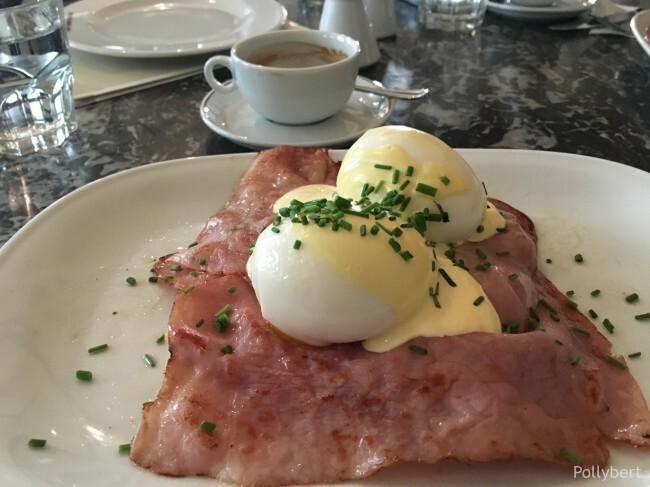 Bezirk, Austria, breakfast, dining in Austria, eggs benedict, Europe, restaurant review, Vienna. Bookmark.